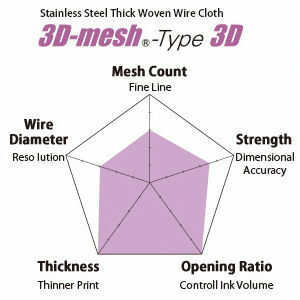 3D Metal Mesh is woven in a special structure that yields a mesh three times thicker than the wire diameter. This makes it possible to achieve 1.5 times higher printing thickness and remarkable leveling capability. 3D Mesh is especially suitable for thick coat printing.